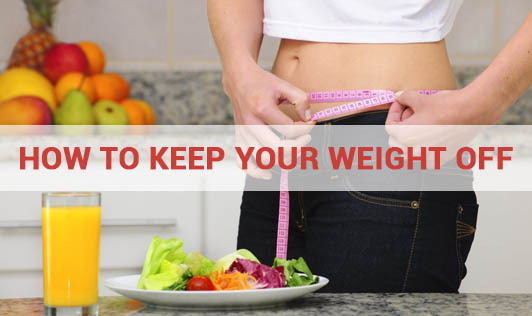 How to Keep Your Weight Off! A balanced eating plan and regular physical activity are the foundation to good health. Used in combination, these 2 health practices can help you lose weight - and keep it off. The best way to go about losing weight is to eat fewer unhealthy foods, watch portion sizes, and do more physical activity. Physical activity can help you control your weight by using excess calories that would otherwise be stored as fat. Balancing the calories you eat with the calories you lose through physical activity will help you reach and maintain a healthy weight. Fact: Fad diets are not the best way to lose weight and keep it off. Fad diets often promise quick weight loss. These diets strictly limit calories. Most people quickly get tired of them and regain any lost weight. Fad diets are unhealthy because they may not provide all of the nutrients your body needs. Myth: Starches are fattening and should be limited when trying to lose weight. Fact: Foods high in starch, like bread, rice, pasta, cereals, beans, fruits, and some vegetables (like potatoes and yams) are low in fat and calories. They become high in fat and calories when eaten in large portion sizes or when covered with high-fat toppings like butter, sour cream, or mayonnaise. Adopting good eating habits and engaging in physical activity will help you achieve and maintain a healthy weight.